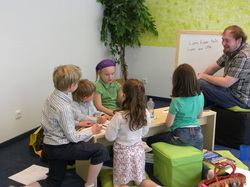 German Language Camp will be held over both Spring Break and Summer Break. How would your child like the opportunity of a lifetime? Your child can now enjoy the summer camp experience while simultaneously learning another language? Click here to learn some more about our Language Camps. Language camps are intensive with grammar in the morning, a break for lunch, then afternoon activities in which the students can apply what they have learned outside of a classroom setting. The Camps will be held over both Spring Break and Summer Break. These camps are offered to children up to the 8th grade. It will give them a review of the previous semester, as well as give them a preview of what is to follow in the upcoming semester.